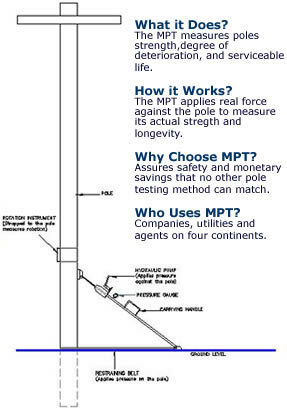 How Does MPT & Pole Inspection Work? * (Also applies to strutural columns and beams as well as poles made of any material). Present methods of pole inspection and testing are approximate and generally subjective. The new Deuar system, based on objective direct measurements of the needed pole strength, saves poles from premature replacement and pinpoints all dangerous poles. It not only provides a more cost effective maintenance of power pole assets but at the same time increases the saftety of the public and utility personel. Analysis by independent structural engineers has validated this pole testing system and vast experience and statistics clearly indicate that the risk of pole failure prior to the next pole assessment is many times less than the present risk. Transmission and distribution network of poles represents an electric utility's greatest single infrastructure investment. Therefore, power pole inspection is of paramount importance. 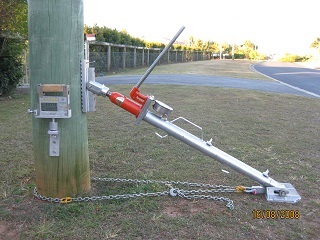 Inadequate pole inspection can lead to accidents and damage to utility's network. Reliable pole inspection methods can both save money and lives.